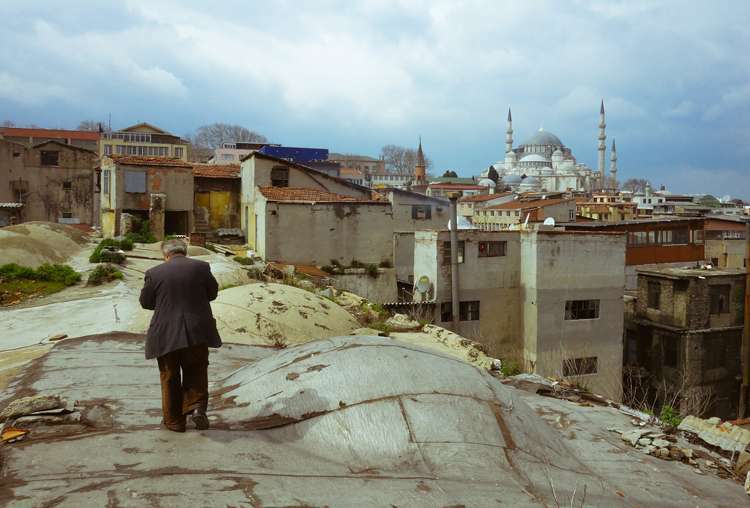 George Alexandris was featured and interviewed in Inspired Eye, now he is back with a series of images from Istanbul. Born in Montreal, Canada to Greek parents, living in Greece on the island of Kos most of my life. I am 41. Working as a graphic artist for print and a illustrator for over a decade in Athens and briefly involved in 2D animation at a small studio for a couple of years which were more fun than pay! Since 2003 I live in Kos, south-eastern Greece, just off the Turkish coast. I enjoy good music – whatever that means. I'm no audiophile. I just know when I like a sound. Same with movies. Grew up reading non mainstream comics, mostly european underground scene and action from the classics of Marvel and DC. Schizophrenic! I read. Mostly history and politics. I like coffee and good food. And I take pictures. I was always involved in creating images one way or another. Had fooled around with film cams as a teen but then forgot all about it. As a seeking and unrest spirit, there is a constant need be creative. Although there were people and friends around already great photographers whose work I always admired, I never thought of trying out expressing myself through pictures. It wasn't until I saw what people were doing with their mobile phones that it hit me. I was amazed. I thought it suited my needs at the time perfectly. So together with the pioneers, if I may say, I got myself an iPhone 3GS (iPhones were the only choice back then) and started snapping and app-ing around with the teenager enthusiasm of a kid with a new toy! After time I developed a style, or styles, and interacted with a whole new and inspiring community. Joining Flickr I met with all sorts of photographers and many encouraged (some insisted) I also get my hands on a “real” camera. In time I upgraded to the iPhone 4 for better quality and at some point purchased a high-end, full manual Point-and-Shoot. Since then, I try not to focus on the hardware part rather than the essence of a good photograph and what it consists of. I am greatly inspired and influenced by the street photography scene. In fact, together with a group of fine people, we admin and curate a group of what we think is the cutting edge of street photography in Greece called GSP (Greek Street Photographers). You can find us on Flickr and Facebook. It's worth a look! So, in a nutshell, one thing led to another and in a very natural evolving way, I found myself shooting pictures! I work with my brother at a family owned business. We supply hotels and stuff. It pays the bills! In this economy a daily job is most important. How did you end up in Istanbul? This wasn't my first time. I am quite acquainted with the city and visiting Turkey is very easy due to where I live geographically. My first visit years ago was via train from northern Greece. It was the first time though I was there on a mission! A personal project of street shooting during my usual daily expeditions in the city and around it. It is a place where there are many friends and where I just love wandering the streets. What attracted you most while shooting there? Any particularities to Istanbul? Istanbul itself is a particularity! Apart from mentioning everything one can find there, as the city is what many consider a photographer's paradise, psychology and sentimental value is also a big chapter during my strolls. As a person who follows politics and history and being in a place where cultures have been and are interacting while the whole region being a huge melting pot, I can't help observing things in a very particular way while at the same time appreciating and enjoying the composition of all those frames before my eyes. Having a greek background also means Istanbul – Constantinopolis or simply Polis to most greeks – combines the past and the present in a unique way. It is a dying city, a reborn city, a city full of contradictions and harmony too. The growth of population during the past decades results to a mixture of peoples and customs. It can be very progressive though very conservative at the same time. One thing is for sure, you'll never run out of amazing scenes and never get tired of what you see. For me, it's a constant study, a city I always look forward going too and enjoy street shooting. What areas would you recommend to photographers who want to visit? All around actually. Ok, everybody will start from the center. That's cool, but if your stay there is long enough get out of the center. Buy a map. Get familiar with transportation, mostly minibuses and boats. It's easy. Ask for advice and start visiting areas up and down the Bosphorus on both sides. Make small daily plans and start early. It's a big city. Feel safe and follow your nose. After that, you can start getting deeper into the city and it's people. Try to have some information and knowledge of the area. Don't hesitate to ask for help. Stay as long as you can. Not bad! Actually, quite well. Have in mind that I used a small and discreet compact. Not that a DSLR would be a problem but just saying. I feel the most helpful part is that while in Turkey I am already in my little corner of the world, the eastern Mediterranean. I know the codes and we have so many similarities as people. Any differences simply are the spice in life. I understand the body language, the way one looks at you, the general vibe. I can speak in Turkish (not fluently but enough to deal with most situations) and know my whereabouts. This helps a lot simply because you are not considered a tourist but someone almost their own. And again, coming from neighboring Greece is usually received with pleasure and a sort of warmth. Turkish (and Greek) hospitality are infamous. In the street, everybody seems to mind their business and if you are foreign they will go out of their way to help. Only a couple of times I got a bit worried and had to deal with unexpected – or expected, as I was looking for trouble – situations. Fortunately all went well. As any large city, there are areas to avoid any provocation but it's no big deal. Most are kind and smile back to you. Many love chatting too. The Sony RX100. Why? Because it was my new camera! I loved using it so much I almost didn't use my iPhone at all. At the time it was the best large sensor compact. Now there is a huge and growing variety of such cameras out there. It's a full manual very capable little camera. It feels nice in the hand and is very customizable. Easy to use one handed and a good menu system with impressive results. Quite stealthy. For a while I was flirting with various systems. Roaming the net for reviews and trying to make up my mind. I ended up with this and since then had plenty of fun together! In the meantime, I recently upgraded to the iPhone 5s (three plus years with the 4) and keep doing what started it all for me. I really wanted to take some pictures inside a Hamam (hot steam turkish bath) that I visualized, but felt awkward about a half naked man taking pictures of other half naked men while bathing and getting scrubbed by guys with thick mustaches! Not any sort of phobia or anything, but a sense of weirdness in a humorous kind of way. Maybe next time! Thank you (again) both for having me here. Great images for such a wonderful city! nice shots…you can feel the smells, the noises, the ambiance…! One of my favourite cities to have visited. Thanks for the journey back there. George’s photographs are so moving, visceral perhaps. And I have thoroughly enjoyed this interview and getting to know him better. Visited there about 5 years ago and had a wonderful time….have family on Limnos.